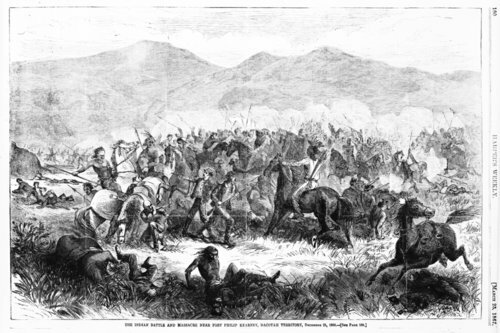 This illustration portrays an Indian battle taking place on December 21, 1866 at Fort Phil Kearny on the Bozeman Trail in Dakota Territory. This illustration was published in Harper's Weekly on March 23, 1867. Funds for digitization provided by Mr. Steve Peckel in memory of William Chalfant.